Skies full of icy water this morning so today will be one of reflection and stock checking. I think I have enough in hand to fill an evening microscope session. Last night's session was mostly filled with disappointingly immature or already listed spiders, which wasn't unexpected. Oh, and an immature centipede (Polydesmus) just to add insult to injury. 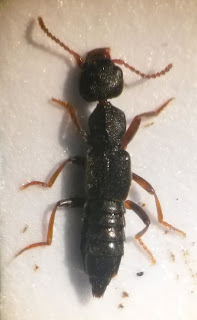 There are only three county records for the genus that I can see - one each of rufipes, erichsonii and orbiculatus. The last rufipes was in 1901, orbiculatus was pre-1900 and the erichsonii record I only have one location for without a date. It's going to be a good record and it's a nice new species in any case. Carding went a bit awry when I dropped the glued card onto the beast and it descended like a spinning piece of toast, but I have more or less salvaged it. Ideally it should be done again. Edit: I have run through all the species listed in NBN. 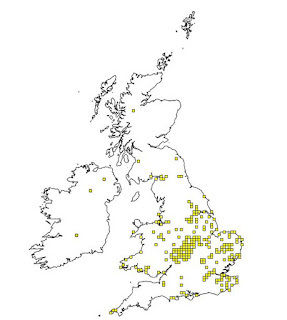 Most species have yellow-tipped elytrae and a limited southerly distribution. erichsonii has large eyes (which from a brief glance I know is a feature tested in the key). Eliminating those one by one rufipes is the only species left standing. All the others are a bit FLAVIpes, which is presumably why this specific epithet was chosen.